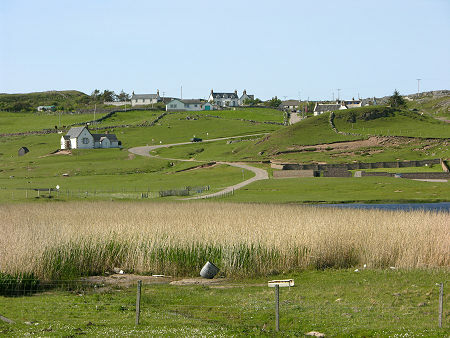 The small village of Stoer lies on slightly rising ground just south of the Stoer Peninsula and immediately north of Clachtoll. 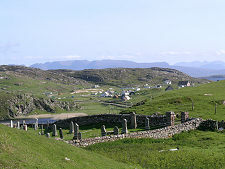 Its scatter of houses and crofts are bisected by the single track B869, the twisting road that follows the coast from Lochinver north then east to Kylesku. The two most imposing buildings in Stoer are closely related, being the church and manse built to Telford's standard design in 1829. 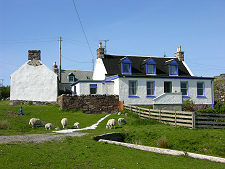 The manse is now known as Stoer House. Near to the Stoer House is the shell of the church, the walls looking remarkably fresh despite their exposure to the elements. 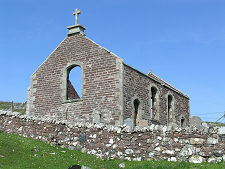 The church seems to have gone out of use at a fairly early date, proving too small to accommodate the large population in the area at the time. 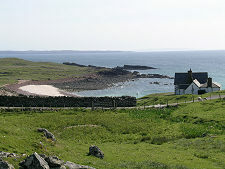 Just to the south of Stoer is Stoer Bay. 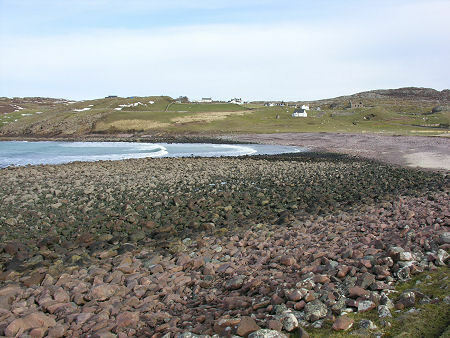 This offers a broad sandy beach and - attracting geologists to the area - rocks that give accessible evidence of the Precambrian environment. Here you'd once have found a semi-arid climate where rivers flowed and silted up, where lakes became established and dried out, and where, at times, the sediments shrank and cracked in the sun. A far cry from the north west Scotland of today! 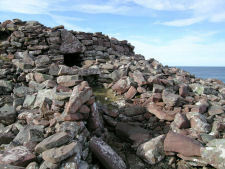 Overlooking the bay from the blunt headland to its south are the remains of Clachtoll Broch. This stands to a maximum height of only 2m around the entrance door, parts having collapsed into the sea. A mile north of Stoer on the B869 a minor road turns off to the Stoer Peninsula. Overlooking the junction is the Rhu Stoer Hall which offers a range of community facilities and functions.